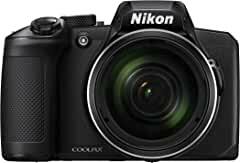 Nikon Inc. has announced the U.S. availability of the COOLPIX A1000 and COOLPIX B600, Nikon's newest high-power point-and-shoot cameras with exceptional zoom capabilities built-in. Designed for the everyday photographer who wants optical capabilities that far exceed a smartphone, the A1000 and B600 feature lenses with 35x and 60x zoom respectively, enabling users to capture high-quality images across a wide range of shooting scenarios. The stylish COOLPIX A1000 delivers high-powered features packed within a sleek, compact design that fits comfortably in a pocket – ideal for a fast-paced, on-the-go lifestyle. Designed with a 35x optical zoom lens that covers a versatile focal range that begins at the wide-angle 24mm1 equivalent and extends to the super-telephoto 840mm equivalent, the camera is versatile enough to handle everything from everyday events to a once-in-lifetime vacation. The compact COOLPIX B600 is equipped with a 60x optical zoom NIKKOR lens that covers an impressive focal length range equivalent to 24-1440mm, enabling users to easily capture events from wide-angle landscapes to super-telephoto close-ups of their favorite ballplayer sliding into home plate. This big zoom power is packed inside a simple and lightweight form factor, making it a great choice for the everyday photographer looking to document their life from both near and afar. The new COOLPIX A1000 (available in Black) and COOLPIX B600 (available in Black) will be available in the U.S. this March 2019 for a suggested retail prices (SRP) of $479.95 and $329.95, respectively.